Could the inflammation that drives psoriasis and other immune-linked illnesses be a major player in heart disease? “Classically a heart attack is caused by one of five risk factors: diabetes, hypertension, high cholesterol, family history or smoking,” explained study lead researcher Dr. Nehal Mehta. “Our study presents evidence that there is a sixth factor, inflammation,” she said. Mehta heads the Laboratory of Inflammation and Cardiometabolic Diseases at the U.S. National Heart, Lung, and Blood Institute (NHLBI) in Bethesda, Md. Another cardiologist agreed the study could open doors to new research. “The future of cardiovascular prevention may require a cholesterol reduction medication and an anti-inflammatory medication,” said Dr. Guy Mintz, who directs heart health at Northwell Health’s Sandra Atlas Bass Heart Hospital in Manhasset, N.Y.
“These are exciting times in the area of cardiovascular prevention,” said Mintz, who wasn’t involved with the study. The new study involved 121 patients who had moderate to severe psoriasis and qualified for anti-inflammatory medicines called biologic therapies. These injected medicines are also used by people with immune-linked conditions such as lupus or rheumatoid arthritis, and include drugs such as Cimzia, Enbrel, Humira, Orencia and Remicade, among others. All of these medicines work by helping to suppress pro-inflammatory immune system activity. All participants enrolled in the new study were at low risk of heart disease at the beginning of the research. Over a year of follow-up, the use of biologic therapy was associated with an 8 percent reduction in coronary artery plaque, the researchers said. Specifically, use of biologic drugs appeared linked with a slowed buildup of fatty plaques in arteries. These are the plaques that can restrict blood flow and cause heart attacks and stroke. The findings suggest that immunotherapies that treat inflammatory conditions might also help cut heart disease risk, Mehta and his colleagues reported. 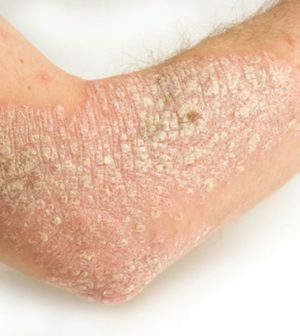 The study authors pointed to prior research that tied psoriasis to the early development of high-risk “soft” arterial plaques. Biologic therapy might cut plaque formation, even in patients without other heart disease risk factors such as high cholesterol, blood sugar and blood pressure, they said. However, a cause-and-effect relationship isn’t clear from this type of study, so “the next steps should be randomized, controlled trials,” Mehta said. As for Mintz, he called the new research “exciting and important, because it highlights the importance of inflammation associated with psoriasis causing blockages in the arteries of the heart to progress. The study appears online Feb. 5 in the journal Cardiovascular Research. The National Psoriasis Foundation offers more on biologic drugs.